Well, it’s official – in a historic election that could have altered the future after centuries of shared history, Scotland has voted “no” to independence from Great Britain. That doesn’t mean that Scots have lost their cultural pride or traditions. They’ll be on full display tomorrow – Saturday, September 20th, when the43rd Annual Scottish Games open in Mount Pleasant. It takes place atBoone Hall Plantation, a nice drive from all our SC vacation rentals, be it a Folly Beach house Charleston or especially a luxury house on Isle of Palms. Boone Hall is located just over the IOP Connector from all our Isle of Palms vacation rentals. Just head north up Highway 17 a short ways and look for the giant sign on your left. It begins at 9:00 a.m. with the presentation of the clans – so prepare to see lots of plaid. Throughout the day, there’ll be lively competition of pipes and drums, Scottish dancing (both country and Highland), and well as “heavy athletics.” This ominous-sounding category includes such events as the Sheaf Toss, the Stone of Strength, and the Caber Toss – you know, when they heave the thing that looks like a telephone pole. It’s almost 20 feet tall, weighs 175 pounds, and they throw it end over end while trying not to knock out themselves or any innocent bystanders. There will also be live music by Rathkeltair, Castle Crossing, and Carroll Brown, not to mention the ever-popular border collie demonstrations, a beer garden, Scottish food and merchandise, and a special kids’ area with games and crafts. Part of the proceeds go to great charities like the Ronald McDonald House. Adults are $18, children $5. Tickets include admission to Boone Hall Plantation. Although this is not considered peak season for Isle of Palms luxury rentals or Folly Beach house rentals Charleston SC, you’d never know it by looking at the events calendar. There’s a lot going on. Don’t forget tomorrow is also the Food Truck Rodeo: Game Day edition, where you can sample some of the best local food on wheels while watching college football on giant screens. Check out the last blog for all the details. Then on Sunday, keep an ear peeled for church bells ringing. The bells and clock of St. Michael’s Church downtown are turning 250 years old(! ), and they have a special public events and a service commemorating their history. They will also be ringing them throughout the day. Incredibly, the bells were forged in London in 1764, and the eight bells range in size from 509 pounds to 1943 pounds. Their sound is unmistakably Charlestonian. Their history is a tumultuous one and involved many trips across the Atlantic. The British stole them as they retreated during the Revolution as a war prize. They were eventually recovered in London and returned to St. Michael’s. During the Civil War, when bells were routinely being melted down for cannon, they were sent inland for safekeeping near Columbia, where they endured a fire. They were recast at the original London foundry and returned to Charleston. For well over a century, they could only be chimed, not rung (in order to ring, they must swing), but finally in 1993 they were refitted and rehung in a proper wooden frame by the original London founders. Ever since, a dedicated team of bell ringers brings joyous melodies to the historic peninsula. St. Michael’s is located at the Four Corners of Law, at the corner of Meeting and Broad Streets. The bell celebration service will take place from 12:15 – 1:00 p.m. on Sunday, September 21st in the church. It will include a duet between the Tower Bells and the church organ; a “History of the Clock” by author George Williams ; and a “History of the Bells” by Daniel Jeffries. 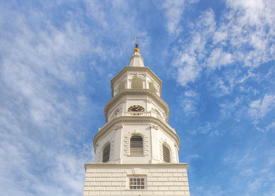 So listen up this Sunday afternoon for history ringing out above the streets of Charleston. And remember, when you’re looking for rental homes South Carolina, specifically beach rentals Charleston, call EP. We can help you find the ideal Charleston beach house from our exclusive portfolio of luxury beach house rentals SC.